Selfless Service | Nook | 99¢ | Dr. Justin Imel, Sr.
Jesus Christ, God incarnate, came to earth to minister, not to be served. No greater calling could one have than to follow in Jesus’ footsteps and minister. The Apostle Paul followed those footsteps and himself ministered in a selfless way. 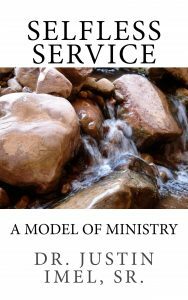 In Selfless Service: A Model of Ministry, Dr. Justin Imel, Sr. sets forth a practical model one may utilize in following Jesus and Paul’s example of ministry in the Kingdom of God.